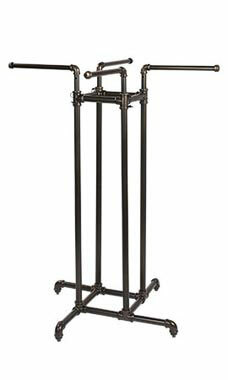 Our 4-Way Clothing Rack - Pipeline Collection is sure to add a touch of style to your showroom floor. Our Pipeline Collection features an dark ash grey finish with industrial pipe accents. The Pipeline Collection is a merchandising system of racks based on the traditional industrial grade clothing racks which are popular in New York's garment district. Our version of pipeline incorporates interconnecting pipes and connectors. Each arm is individually adjustable from 48" to 72" high with 10 different adjustment heights which are 3" apart so they can be placed in different positions to highlight your apparel on multiple levels. Easy to use pins hold the arm at the chosen height. Optional casters are sold separately.